Hello! 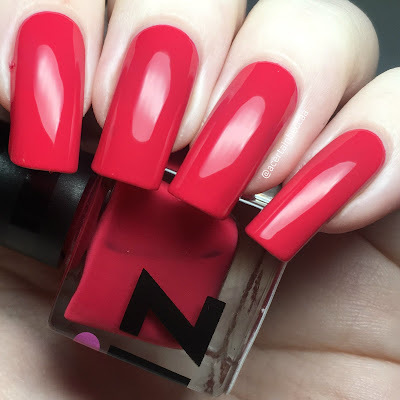 Today I'm back sharing some iZ Beauty of London polishes. iZ Beauty have a massive range of shades perfect for Summer, five of which they've sent me to play with. This time around all five are cremes, but if you are after holographics, check out my swatches of some of the Crystal Vision Collection here. For my full swatches of the cremes and more info, read on! One of the polishes I was sent is one I've shared previously, so I'll start with that. 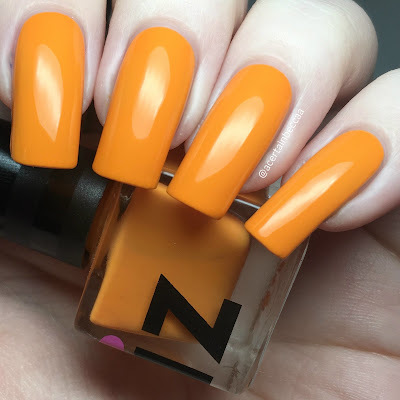 'Sold Out' is a bright yellow-toned orange creme. The formula is smooth and easy to apply. It does start off a bit sheer and streaky to begin with, but builds up well in three coats. If you want to see the difference in my previous (not even a year old!) swatch, you can see that here. 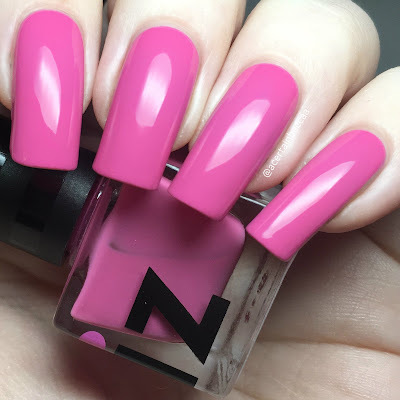 Below is three coats with topcoat. The remaining four polishes are all new to me. 'Swing Fling' is a bright bubblegum pink creme. It has a smooth and easy to apply formula. The first coat is a bit sheer, but I think most people could get away with it after a second. I had some slight nail line so added a third. Below is three coats with topcoat. 'Pom-A-Rita' is a pink toned red (or red toned pink I guess!) creme. It has a smooth, easy to apply formula. This starts off sheer, but covers evenly. I could still see my nail line fairly well after two coats, so added a third to bring it fully opaque. Below is three coats with topcoat. 'Lime Isle Sour' is a bright pastel lime green creme. The formula is smooth and easy to apply. This covers nicely in two coats, but it is a little on the streaky side. I did need a quick third to even out some streaks. Below is three coats with topcoat. 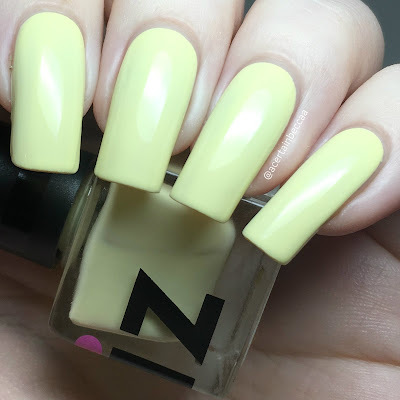 'Lemon Meringue' is a soft pastel yellow creme. It has a smooth, easy to apply formula. Being both a yellow and a pastel, this is streakier than the others. I applied thin coats, so still had some minor streaks after my third coat. I did add a fourth, though three thicker coats would have been fine. Below is four thin coats with topcoat. What do you think? It's no surprise that I love them! 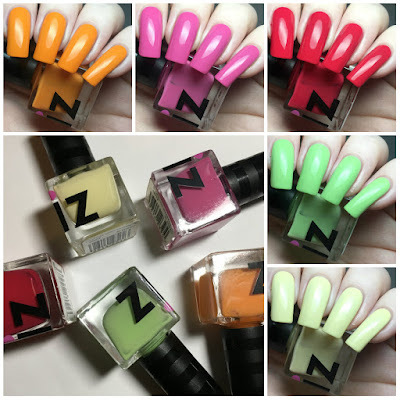 I find iZ Beauty formulas to be reliable, and all of their polishes dry super glossy and wear well on me. 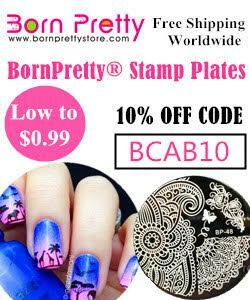 All of these are perfect for nail art, both as bases and to use for the art itself. I have used a couple of them in manicures that I'll be sharing shortly, so keep an eye out for those! You can find all five polishes mentioned along with plenty of other Summer shades (and all shades really!) on the iZ Beauty of London website here.